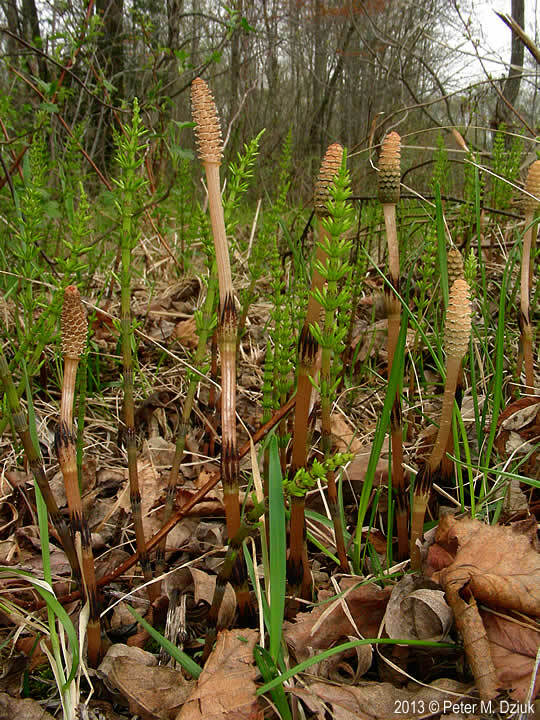 Equisetum arvense sterile stems. 2012 © Peter M. Dziuk. Minnesota Wildflowers. minnesotawildflowers.info (Accessed 4/2017). Equisetum arvense is a cryptogram, perennial herb, extensively colonial from slender, dark, branching, tuber-bearing underground stems (rhizomes) that can be up to 1.5 m deep and up to 100 m long; new stems can arise from rhizome fragments or tubers; sterile stems to 50 cm tall, green, hollow, thin, rough-textured, jointed, with whorls of leafless, green, horizontal branches from below each node, stems and branches appearing jointed. Equisetum arvense leaves. © 2014 Katy Chayka. Minnesota Wildflowers. 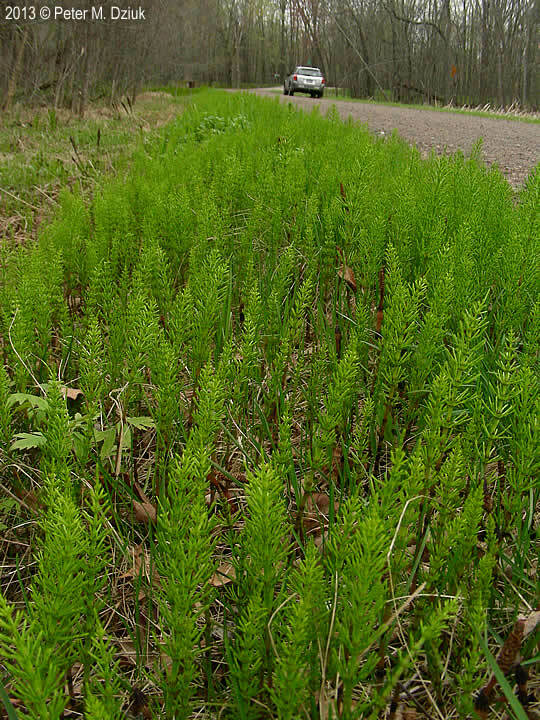 minnesotawildflowers.info (Accessed 5/208). 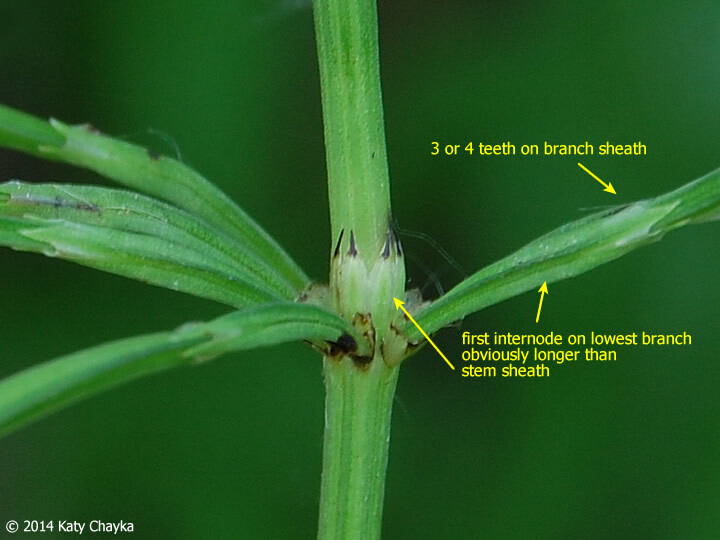 Leaves: reduced to toothed sheaths around each node, teeth narrow, tips pointed. Equisetum arvense fertile and young sterile stems. 2013 © Peter M. Dziuk. Minnesota Wildflowers. minnesotawildflowers.info (Accessed 4/2017). Spore cones (strobili): brownish, 0.5-3.5 cm tall, on whitish to brown unbranched, fertile stems to 30 cm tall, ephemeral, withering once spores are dispersed (often before sterile stems emerge), ringed by dark, toothed sheaths; appearing early in spring, March-June. Spores produce either male or female gametophytes, green, haploid, moss-like, flat plants 0.2-0.5 cm across that produce eggs and sperm. These unite to form the diploid embryo of the large sporophyte. (Raven et al 1986). Equisetum arvense large roadside colony. 2013 © Peter M Dziuk. Minnesota Wildflowers. minnesotawildflowers.info (Accessed 5/2018). Habitat: Moist to wet open areas, poorly drained soil and high water tables, roadsides, ditches, disturbed sterile soil, fill, railroad embankments; colonies in apparently dry sites usually have rhizomes reaching down to saturated soil. Equisetum arvense fertile stems and young sterile stems. 2013 © Peter M. Dziuk. Minnesota Wildflowers. minnesotawildflowers.info (Accessed 5/2018). Notes: Forms dense colonies that are important for prevention of soil erosion. Prefers soil pH 4-7, moderately tolerant of shade and anaerobic soil, drought, and salt (USDA, NRCS 2006). Plants eaten by Geese and Muskrats (Martin et al. 1951). Plants contain thiaminase which destroys thiamin, can be toxic. 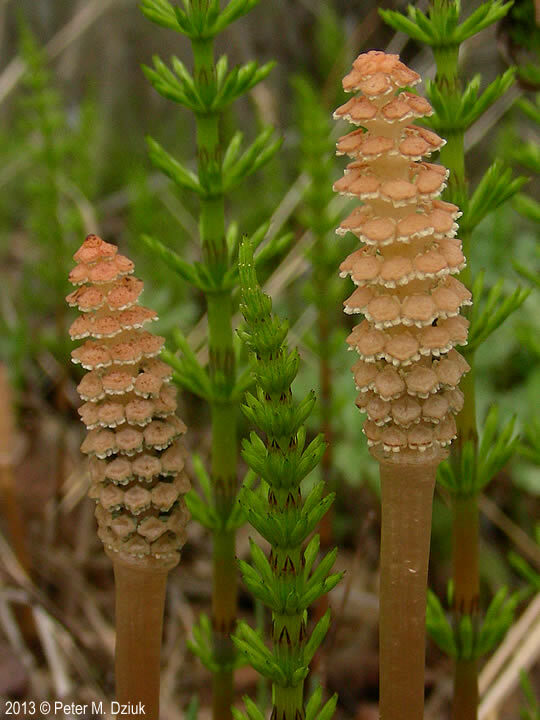 Cell walls contain silica deposits typical for all Equisetum species, which may constitute up to 6.9% dry weight. 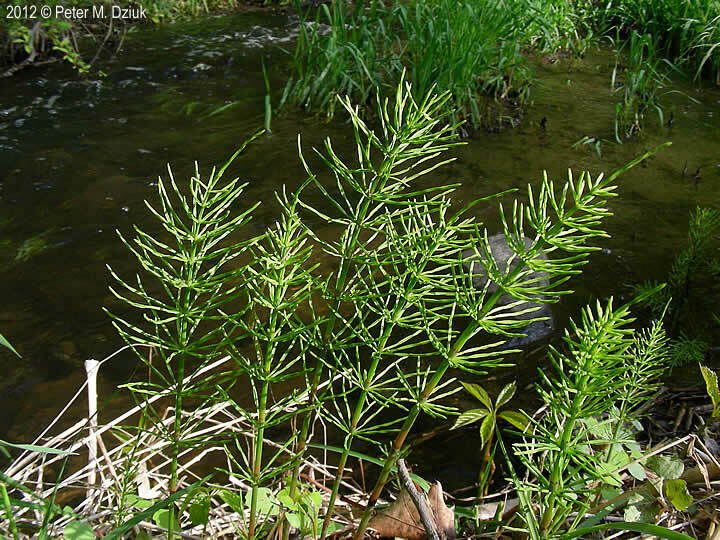 Field horsetail also tends to accumulate heavy metals (Kingsbury 1964; Cody and Wagner 1981). Tolerant of burning and cutting, stems resprout from rhizomes throughout the growing season. Eaten by Dolerus spp. (Hymenoptera), and possibly by Grypidius equiseti (Coleoptera). Attacked by several fungi including Phoma equiseti (Cody and Wagner 1981). Has been used medicinally as a diuretic (Rook 2004).